When choosing world map projections from the customary library of available layouts, the problem reduces to picking the least worst alternative. But, when our interest is ocean currents, the customary library works pretty well. Here’s why: Earth’s rotation in space — spinning on the polar axis — drives the ocean currents. So a world map that centers up a pole shows the rotational axis as a point (a line seen on end appears as a point) and shows the currents with the same (or similar) clarity of understanding as an axial view of motor. August 2012 EDIT: A real live professor of oceanography corrects me. Earth’s rotation in space does not drive the ocean currents; my expert source says the primary drivers are wind (for surface currents) and density differences (for subsurface currents). See comment(s) below by Petruncio for more detail. My info about rotation came from Nat’l Geo, and I may have misinterpreted their article. Need to check it . . . The projection we want is an “equal azimuth,” and it looks like a circle which we may imagine to be spinning like a wheel. One pole is the point at map center, the other pole is the circle the makes the map’s edge. This is a little confusing, because now what used to be a point (the opposite pole from the one we put at map center) is now a circle within which is shown the whole surface of the earth. But that’s just the trick of equal azimuth — it gives a point (something of zero dimension) a size. The scale at map edge is infinite, but let’s not bog down. Besides, we may reverse our choice of pole for map-center and only think halfway (crop each map at the equator), employing two maps, each of which encompasses a hemisphere. Of course that defeats the purpose of using a world map, getting to see the interplay of all the currents all at once. So give it a try. Work up to that outer circle slowly. Remember, it’s the patterns made by the ocean’s currents that we are contemplating, and earth’s rotation is the ocean’s motor. Here we see SURFACE, MID-LEVEL, and BASEMENT CURRENTS in Red, Green and Blue respectively. Thanks National Geographic, for showing us how they go. (NG used an elliptical map centered on the Equator, and mislabeled 10 degrees south latitude as Equator, but hey, mistakes happen. Forgive.) I merely put them in equal azimuth projection, 10 degree graticles. SEASONAL REVERSIBLE CURRENTS (culled from several sources) are in Yellow. LAND is Grey, with land and ICE 10,000 feet and more above sea level in White. What’s that you say? A little hard to follow things — especially the play of Antarctica’s gulfs — at map edge? And what, around the periphery, are those trails of white dots? All right so far, you perhaps say. But what are the several shades of Grey? 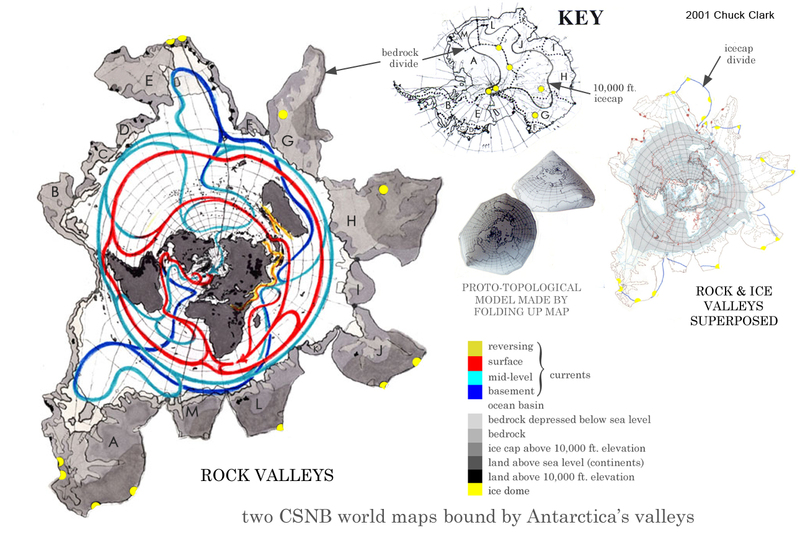 And, since Antarctica is covered with ice, what valleys do we see on this map, rock valleys or ice valleys? Answers: Shades of grey are various categories of rock (in relation to sea level), and the valleys shown are rock. And, though you didn’t ask — yes, the map does fold up, to highly condensed globular object. Here’s a little poster with specifics. Sorry for the low resolution on these images. Wow, this is a most interesting article. These currents will be there for many years to come. It just makes me realize how far we have come since the middle ages. We now know that if we are a water molecule off the coast of florida, there are a multitude of currents we can follow to get to the North Pole to meet Santa! These world ocean current maps are fantastically informative. The South Pole map reminds me of the map of the clipper route from Australia to Britain around Antarctica provided by Geoffrey Blainey in his book The Tyranny of Distance. I’m hoping to float large polymer bags of fresh water through the currents of the ocean, as Dr Ian Edmonds has suggested in his article Northern River Water for Australian Cities? and as Terry Spragg describes at waterbag.com. We eventually want transport routes that can be fuelled by ocean currents rather than fossil fuels. Robert, I’m happy to be of help. If you use any of the current maps please don’t neglect to credit my website. Your project is fascinating. Please keep me informed. I’m presently working on an animated overlay (for one of the current maps) of cloud movements during a six-week-period of the 2009 hurricane season. Regards. Re: New forum topic for ocean currents! The currents of the world ocean are like the arteries and veins of our body, circulating nutrient to keep the whole organism healthy. The ocean is 361 million square kilometres in size, 71% of the earth surface. As we consider the crowding of our planet, people will naturally look more to how we can live on the ocean in a sustainable way. One day, we will manage the world’s climate, food and fuel security by understanding and using the ocean as the driver of a single integrated system of planetary ecology. I would be interested if you could say what the depth, speed, nutrient load and temperature are of the red, green and blue circumpolar currents around Antarctica. Hope this is not too much trouble. Robert, Those would indeed be interesting things to know, but I am merely a mapmaker, with elaborate skill only in how the surface of the object is unfolded. All the info, like these current lines, I put on the maps is just stuff I’ve gathered from other sources. You’ll have to hunt down the oceanography experts for that sort of detail. Sorry. The mapmaker stands corrected by a professor of oceanography. Hello, thank you Emil for your comment. I agree Chuck has provided very interesting and useful views, especially by placing Antarctica at the centre of the world ocean. Another apparent discrepancy between the map at your linked site and Chuck’s map is that Chuck presents a north moving surface current in the Pacific Ocean to the east of New Zealand, but this is not apparent in your map, unless the difference is simply an artifact caused by the different projections. Robert, the north-moving surface current to the east of New Zealand, not apparent on the Emil-link map, is taken from the National Geo map. It is not an artifact of the projection, so a discrepancy. Any experts out there who’ll straighten this out? There is a surface current which flows northward along the east coast of New Zealand (see http://www.teara.govt.nz/en/ocean-currents-and-tides/1/1 ). 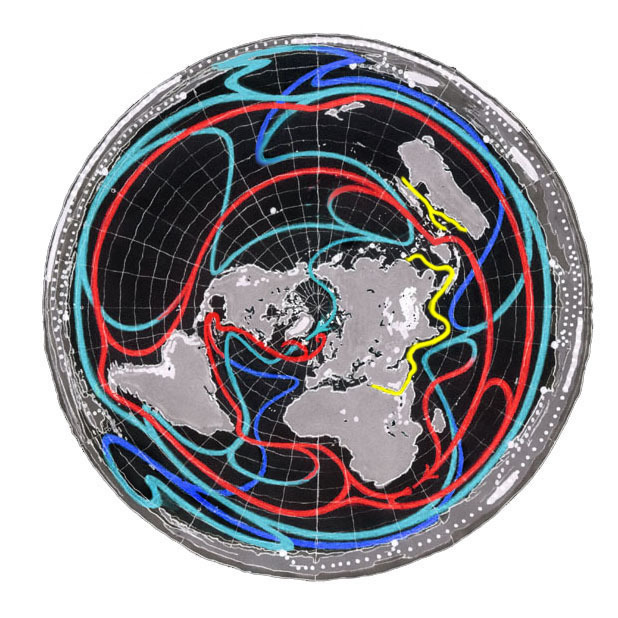 It does not appear on the map which NASA adapted from the American Meteorological Society, probably because that map is simply an attempt to show the major ocean currents and the gyres in the ocean basins. The flow along New Zealand could be viewed as contributing to the southern portion of the gyre which flows around the southern Pacific Ocean. hi, just wondering, if there is more earthquakes in indonisia and the the plate rises more and restricts the warm flow through there, will all the currents stop, and cause a worldwide drought. like what happened to the egyptians. Well, I’m no expert on anything but mapping, but I doubt anything like what happened to the Egyptians (surely you mean the ancient Egyptians?) is in the cards for the whole world. There’ll be more earthquakes in Indonesia, as well as everywhere else, I think everyone but nutjobs will agree with that, but in my opinion you really don’t have to worry about “the plate rising more and restricting . . . [ocean current] flow through there.” My most informed sources tell me (they’re a minority view, but that’s usually the case with the arrow of knowledge) that the disposition of continents is pretty much the same now and into the future as it’s been for a good long time, say the last billion years or so. Best steer I can give you is to look beyond the plate tectonics paradigm for some more overarching theory — see what you can come up with. Sea-floor spreading is really happening, but the other end of the cycle — trench subduction and the so-called Wilson Cycle — are being contradicted by experiment. Drop in here http://www.ncgt.org/ and look around. And in any event the currents ain’t gonna stop. If they get blocked up somewhere they’ll just reorganize. Me, I’m a lot more worried about the antarctic ice sheet suffering a nudge toward the coast. If it ever gets started moving, it’s not stopping ’til it’s in the sea. Thank you Chuck and Robert for these gorgeous visuals and a fascinating discussion. I would like to post a summary of it in a new Systems Thinking group (not yet public) on Facebook, crediting both of you and National Geographic. As per Emil Petruncio’s comments, my summary presents this as the Earth’s rotation influencing ocean currents. Chuck, could we use the North Pole axial view as our icon for a while? Well, in my book, anyone who knows when to use “a while” vs. “awhile” can have what she wants. But, since Ms. Ciancio wants permission to reuse an image, a few clarifications, caveats, and conditions are in order. Although before I get to those, let me praise Ms. Ciancio for asking. Unlike, for example, the sleazeballs at Mail Online who, in addition to misspelling “revolutionize,” used my image without credit. 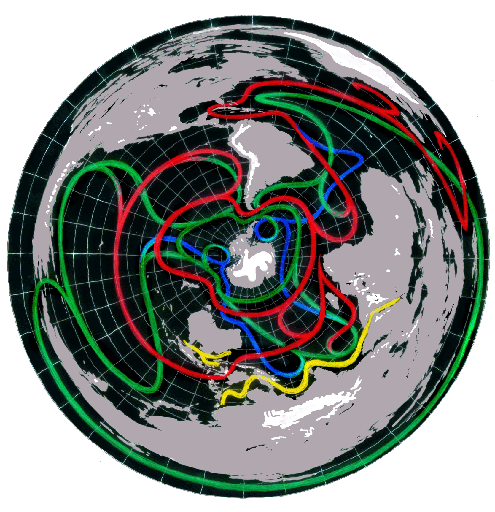 Their June 2009 article reported on findings, published elsewhere (“Britain’s Institute of Physics’s New Journal of Physics”), purporting to link the movement of ocean currents with Earth’s magnetic field. Maybe so. Maybe not. But my map was not part of the original study, I’ve never read the original study, and, being only a mapmaker, even though I personally find the idea intriguing I have no credible thoughts it. So to run across my uncredited image in a mainstream (? — ha!, teeny pun there) press website is an irritant to me, as it should be to everyone who freely makes images available for non-commercial and educational use online. Note to all: use an image, credit the image. Ms. Ciancio: I think it not necessary, and perhaps misleading, if you credit Nat’l Geo. for any of this material. I used their map only as one source among many, and, even accounting for the change in map projection, the paths of my currents diverge (at times significantly) from what they showed on their map. And (see my edited comment in the main post), I may have misinterpreted their article when I (mistakenly, according to Petruncio) said that Earth’s currents are driven by Earth’s rotation. Better to leave Nat’l Geo out of it entirely, or hunt down the article (sorry I can’t immediately pull up the issue date), draw your own conclusions, and credit accordingly. Not to digress, but as hinted in the comments above, the more you research what and where are the ocean currents, the more you find out that no one really agrees precisely on the issue of where they are, and which are primary. And methods of depicting the currents also varies from lots of little cumulative arrows to (as I have elected) long, powerful strings. Thus any map of ocean currents reflects the purposes, aesthetic judgment, biases and weaknesses of the mapmaker. 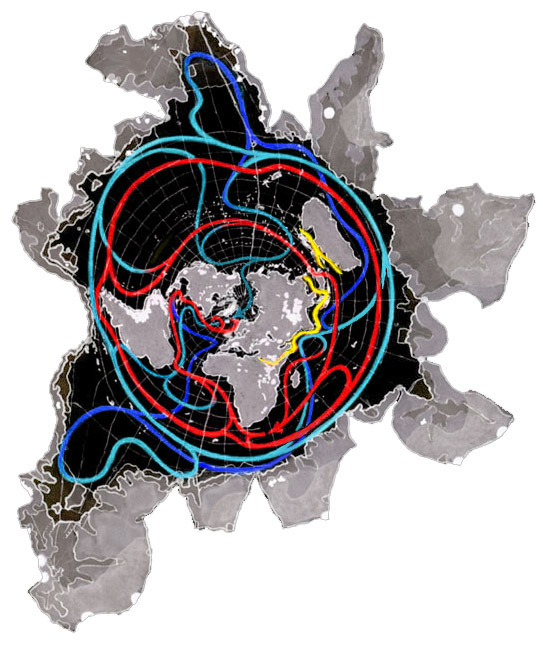 My most targeted aim was to explore at the grandest posture of exposition the global affect on ocean flow (whence the focus on surface, mid-level, basement and seasonal currents) of Antarctica’s two great gulfs. As several commenters have pointed out, I have overlooked or ignored important currents. And my map may overstate the actual significance of Antarctica’s gulfs of the global disposition of continents and oceans. But back to your request. (a) credits, in a fashion obvious to the interested reader, both me and my website, i.e., “Chuck Clark, architect, Atlanta, GA, http://www.rightbasicbuilding.com“. (b) does not bring any commercial benefit to yourself, your group, or other entity, person or endeavor. If it does, or if you want to use the image for a longer period, please get back in touch and we’ll work out something equitable. Let me know if you want me to produce the icon. The posted file is a jpeg, so reducing it to icon size may infect it with ucky visual artifacts. A teensy .png file (made from the original .tiff) is probably best. Also, please also let me know when the Systems Thinking group on Facebook goes public. I’d like to follow along. Tthank you for your interest and attention. From the beginning, sun, winds, and the spinning of the Earth have conspired to keep the ocean in motion and put a twist in the direction of its currents. Swirled by the planet’s winds and rotational forces and confined by its landmasses, the water spins to the right, or clockwise, in the northern oceans and to the left, or counterclockwise, in the southern. Easterly trade winds near the Equator push water to the west, while westerlies in the mid-latitudes push it to the east. Together, wind and spin create huge circulating gyres (from the Greek gyros, meaning “circle”) made up of currents. Because of the planet’s rotation and spherical nature, the currents are more intense in the western part of the gyres, creating such narrow, swift western-boundary currents as the Gulf Stream, which rolls from the Straits of Florida out toward the Azores in the Atlantic, and the Kuroshio, the indigo blue Pacific current that runs up the continental shelf off eastern Asia. describes something called Ekman Transport, which seems to be the ticket. I’ve also compared the surface gyres in Petruncio’s link (nice map, by the way) with mine, and several regional features are not shown in my maps: Guinea Gyre, Alaska Gyre, West Greenland Current, Oyashio Gyre, and Falkland Gyre, in addition to the missing Kuroshio Surface Current. The Natl Geo map also omits these features, I’m guessing because of their focus on interrelationships of surface currents with large-scale mid-level and basement currents. I also recommend Petruncio’s link for the text, which gives a nice understanding of the various widths and speeds of surface currents, based on whether they hug the easterly or westerly shores of their respective basins. Westerly currents (I learn) are narrow and faster than their easterly counterparts, which tend to be much wider (by a factor of ten) and of course slower. My maps fail to capture these aspects entirely. But because my maps don’t have to solve the problem of a clear presentation of global currents on a map that interrupts (or greatly distorts) the ocean, thereby necessitating compromises of simplicity, I ought to be able to add these important regional features without garbling the big picture. I’ll try to get to this . . .
. . . okay, getting to this now. Keep your eye peeled for something called The Water Atlas, due out some time next year. If not there then here in due course.